Are you looking to dress up as a classy First Lady for Halloween? When we look back on US history, Americans fondly remember President John F. Kennedy's wife Jackie in her iconic two piece pink suit and stylish '60s hair. If you want to dress up as this legendary First Lady, we recommend these beautiful Jackie costume and accessories to create the look. 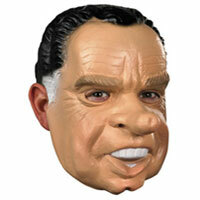 You can also dress up for Halloween as a couple by getting the John F Kennedy mask for your partner. Classic Jackie O costumes are also good for dress-up parties, patriotic holidays like President's Day, and historical events. This vintage 2 piece pink suit will look great as a Jackie Kennedy costume for Halloween. If you want to look like a classy historical figure like Jackie O, we recommend this iconic pink dress. Complete your Jackie O costume with this classic '50s style wig. If you want to revisit 1950's style, grace, and poise this Halloween, you should wear this vintage style pink dress made famous by America's most memorable First Lady Jackie Kennedy. 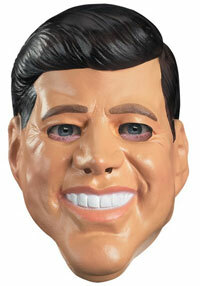 This is a nicely detailed vinyl full Halloween mask of John F. Kennedy. This JFK mask will fit most adults. We hope you were able to find what you are looking for. 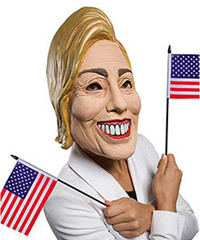 If you are interested in ex president masks and media celebrity Halloween costumes, take at look at our sidebar menu for more political costume ideas.